If you like tequila, thank a bat. If that’s not possible, thank a humming bird or a moth. Those three pollinate the Agave from whence tequila comes as well as food and many other products. Man has been harvesting and utilizing Agaves for approximately 9,000 years. The huge plant comprised a huge part of primitive man’s diet. The most commonly known, Agave americana, is from Mexico as are most Agave though there are two native to Florida. Closely related to lilies there are three major parts which are edible: flowers, stalks or basal rosettes, and the sap. Leaves are a lesser edible part of the plant. During the summer Agaves can produce several pounds of flowers each, which can be boiled or roasted. The stalks before they blossom in summer can also be roasted and taste like molasses. If you leave a depression in the bottom after taking the stalk it will fill with sap, which can be used to make tequila. The root is caustic, so you need to handle it carefully, but once cooked for a couple of days it’s sweet. Flower nectar can be used to make sauces or sugar and bottled will last up to two years. What can be eaten from each species differs significantly, this is just a general overview. Check out your own Agave. The leaves contain saponins and are rich in sap in the winter and spring. They can be roasted. You chew them then spit out the fiber. The leaves can also be boiled and the juice used as a soup but test a little first. The leaves and juice can be too bitter to eat. There are over 200 Agave species so make sure you have an edible one. Spine arrangement, length and shape help tell the species apart. The leaves of most make good cordage. Warning: Raw Agave juice can cause dermatitis via calcium oxalates raphides. DO NOT CUT WITH A CHAIN SAW. WEAR EYE PROTECTION. 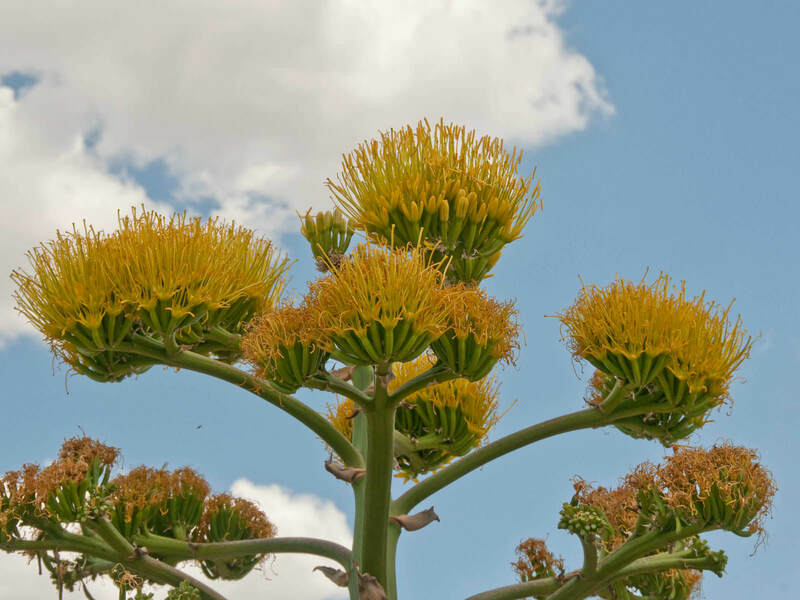 Many Agave flower only once, putting up a tall stalk of aromatic blossoms and then dying. Most of the carbohydrates and sugar is in the body of the plant and the bases of the leaves, excluding the green parts. As the plant ages the amount of carbohydrates and sugar increases as does the plants palatability. While the foraging rule is often “young and tender” the opposite is true with Agaves, old and tough are the best. Miguel del Barco, a Jesuit priest at the Mission San Javier in the Sierra de la Giganta between 1738 and 1768, wrote a detailed account about how the natives used the agaves. They knew exactly when a plant was to flower and used hardwood tools to cut up the plants, favoring the upper part because it was the most tender and juicy for eating. After taking off the top they removed the leaves and then pit baked the plant. That usually involved digging a hole, lining the hole with rocks, building a huge fire in the pit, and when reduced to ashes, putting the plant in and covering it to hold in the heat then coming back the next day to dinner. That ended up with some partially cooked Agave and there is evidence some of them were also eaten raw. Because agave are so huge it’s difficult to call them something one would forage. More so, there’s a huge amount of food there. It might be viewed as an emergency food supply. Other than blossoms or the stalk, the best way to get one is when land is being cleared or redesigned. Then find a village to help you process and eat it. The following species have been used for food in some way: A. americana, A. atrovirens, A. cantala, A. chrysantha, A. crassispina (Agave salmiana subsp. crassispina), A. deserti, A. palmeri, A. parryi, A. salmiana, A. asperrima (A. scabra) , A. shawii, A. sisalana, A. tequilana, A. utahensis. Avoid Agave lechuguilla. It is known to be toxic and is found in Texas, New Mexico and northern Mexico. Sometimes it is planted as an ornamental. It is known to sicken sheep, goats, occasionally cattle but not horses. The Agave is also nature’s hardware store. Several produce fiber, razor strops, pens, nails, needles even didgeridoos. The raw leaves can be beaten for a foamy material similar to soap.